The Riverbottom Trail is a “Tale of Two Trails.” The trail in its entirety covers nearly 4 miles. 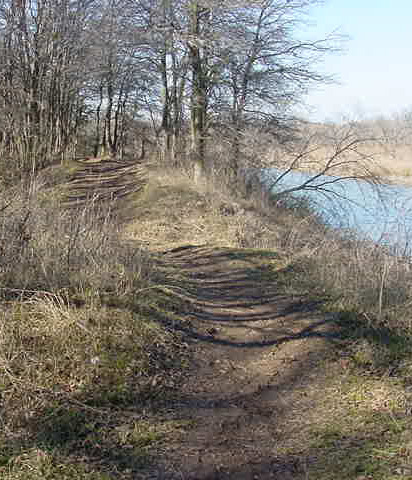 However, the trail can take you to two areas of the Fort Worth Nature Center & Refuge. Access can be found from many parking lots along Shoreline Drive. However, starting from the Hardwicke Interpretive Center (HIC) via the Caprock Trail can diversify your hike. From the Caprock Trail to the Boardwalk, the trail covers 1.23 miles and takes you through more of the Riverbottom forest. Along this trail you will see wildlife that would be more inclined to a wooded habitat such as White-tailed Deer, Nine-banded Armadillos, Fox Squirrel and many species of birds. Essentially this trail is your pathway to the Marsh Boardwalk if you are beginning at the HIC. Along this section of the Riverbottom Trail, you have access to the Wild Plum and Forked Tail Creek. Going the opposite way, the Riverbottom Trail will allow you to walk alongside the West Fork of the Trinity River. Along this trail, you will get great views of the water and birds that frequent the waters; such as Great Egret, Great Blue Heron and woodpeckers high in the trees. During winter, the waters are filled with migrating ducks, American White Pelicans and Double-crested Cormorants. Evidence of beaver can be found along the trail with gnawed trees and current and former beaver lodges. This section of the Riverbottom Trail covers 2.72 miles and ends when it connects with the Canyon Ridge Trail. For those that are seeking to put miles on their feet, this is the trail to hike if you are trying to reach Greer Island from the HIC. Taking this route round trip will cover just under 12 miles.